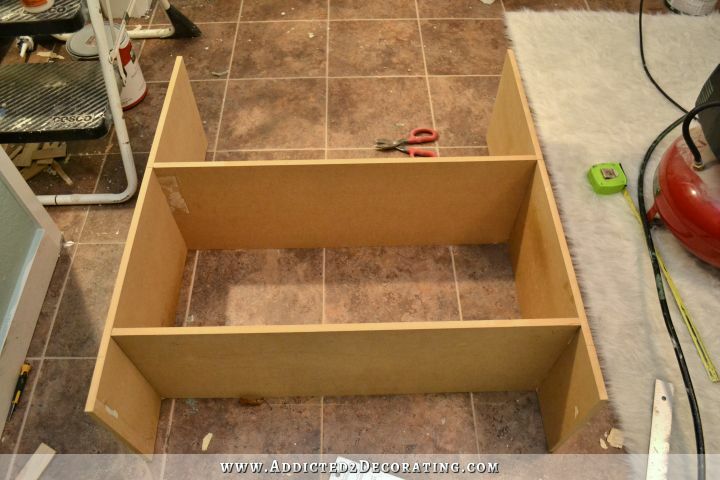 Today’s fun topic is “How To Build a Bookshelf” when you’re tired of tedious project stuff! I was working at the condo again yesterday, and I reached a point where I had my fill of doing the non-fun stuff, like scraping wallpaper (which I finally finished! ), painting walls, caulking baseboards, painting interiors doors, etc. So I decided to work on a fun, creative project. I’ve been thinking that the area between the window and the original closet in the bedroom needs a little something. I tried a chair and side table, but those just didn’t look right because the chair stuck out too far and got in the way of the original closet. Then I realized I had a ton of leftover wood scraps from past projects, so I could just build something! 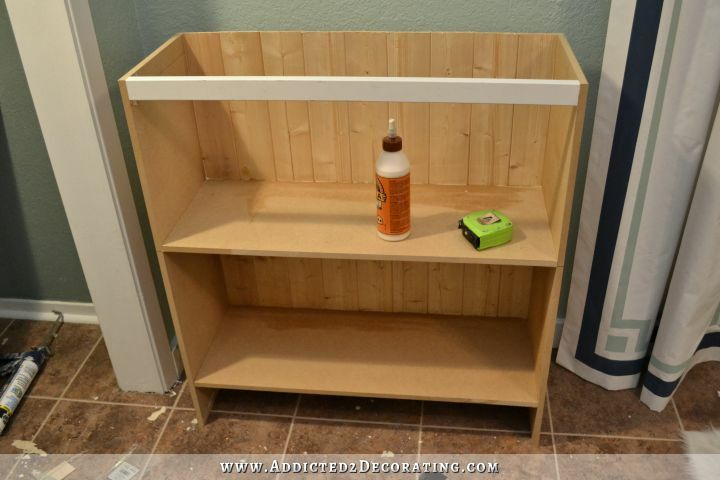 How To Build A Bookshelf From Scraps! Then I placed a thin bead of wood glue in each groove, and glued the pieces together. I set it aside to dry while I moved on to the other steps. Next I used my circular saw to cut the two sides for my bookshelf. My sides measured 33 inches by 11.5 inches. I used a measuring tape and pencil to mark the placement of the shelves. The first (bottom) shelf would be five inches from the bottom, so I measured and marked that on both sides of each side piece. …and placed it along the guide line that I drew. I used the guide line on the other side of the side piece to know exactly where to shoot my nails to hold the shelf in place. I nailed from the outside of the side piece, through the side piece, and through the edge of the shelf, as shown by the placement of the nail gun below. Before shooting the nails, I used my framing square to be sure that the side piece and the shelf piece were sitting square with each other. I repeated that process on the other side, and my first shelf was in place. Then I lined up the second shelf with the second set of guide lines and glued and nailed it into place in the very same way. And then I added the backing. I first placed a bead of wood glue on all of the edges (side pieces and shelf pieces) and carefully placed the backing on so that everything was perfectly square. 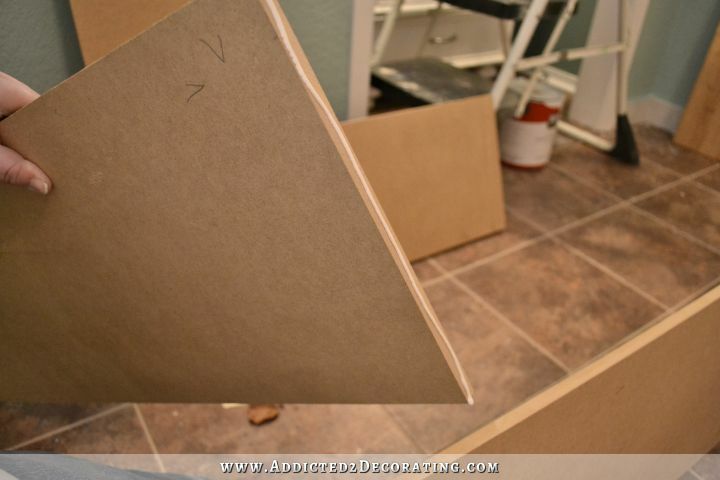 I nailed the backing into place along the two sides, and then carefully measured and marked the placement of the shelves so that I could nail the backing into the edges of the shelves as well. 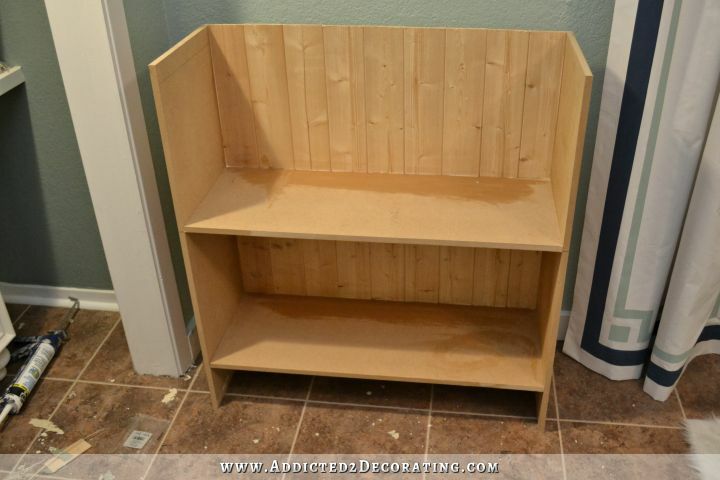 With the backing glued and nailed into place, the bookshelf was very sturdy, so I could stand it up, and use a wet rag to wipe away any excess wood glue. One last supporting piece was needed before I could move on to trimming out the bookshelf. 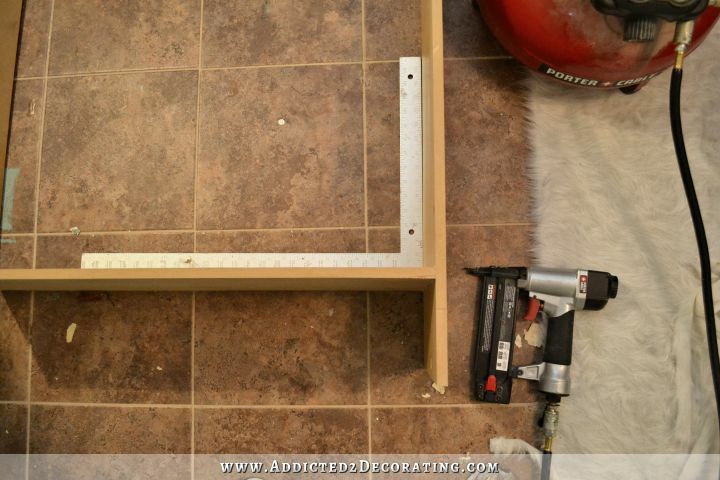 I cut a piece of 1″ x 2″ to go at the top front of the bookshelf, and glued and nailed it into place. This would not only give the bookshelf added structural support, but would also give me something to nail the top rail to. Then it was finally time to start trimming everything out. Remember my advice from a couple of weeks ago — it’s fine to build something like this out of MDF, but I strongly suggest that you use real, solid wood lumber to do all of the trimming. Real wood lumber is much stronger than MDF boards, and will give your piece much more strength and durability than MDF boards will. 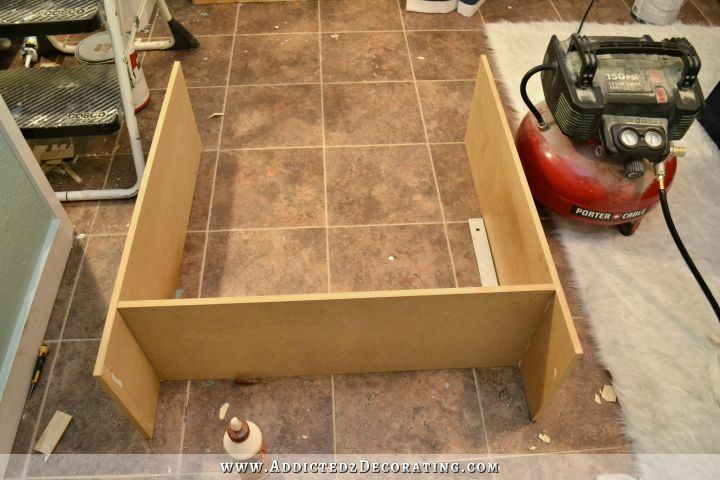 I started with the stiles by cutting two pieces of 1″ x 3″ lumber to the height of the bookshelf, and I glued and nailed those to the front along each side. Next I added the rails. 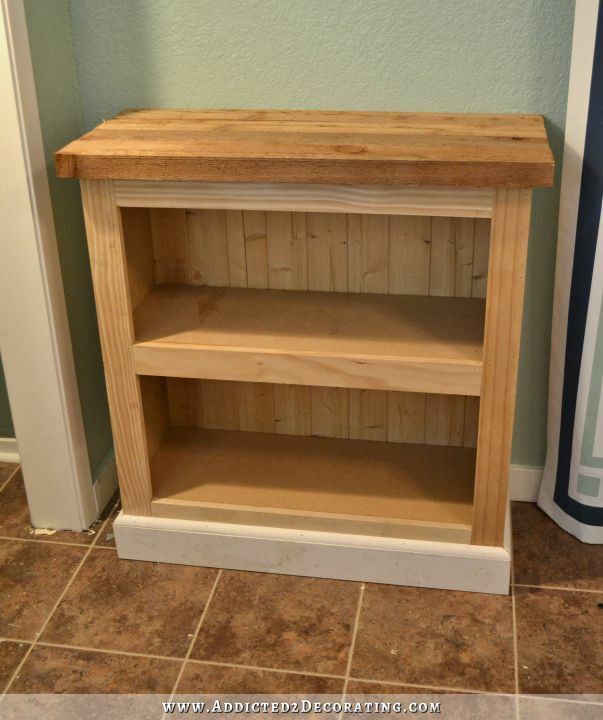 I used 1″ x 3″ lumber for the top and middle, and then 1″ x 2″ lumber for the bottom one. The only reason I did this is because I was using scraps, and I ran out of 1 x 3’s, and I knew that the bottom would be covered up on the finished bookshelf. However, you can choose to leave off the bottom decorative pieces that I added, and just have the two stiles as the “legs.” In that case, you’d need to use the same width of wood for all three rails. 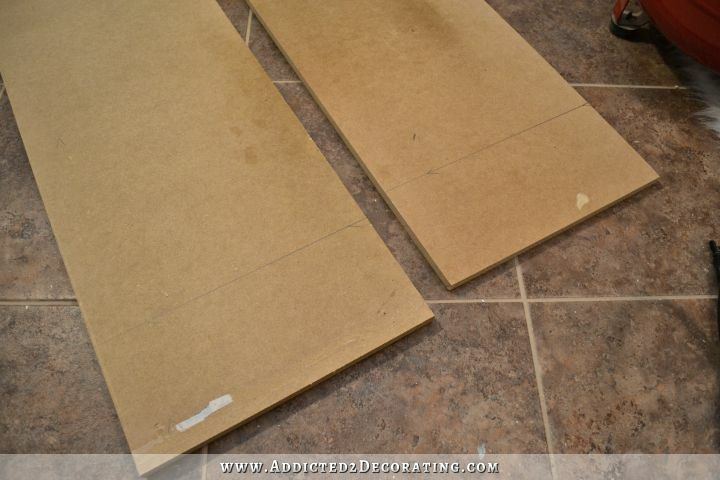 Because I did want a decorative base, I cut three pieces of 1″ x 3″ MDF board, mitered on the front corners, and attached them to the front and sides of the bookshelf. And then to cover up the gap, and to add a bit more of a decorative touch, I added quarter round on top of the 1″ x 3″ pieces. I’m still considering using my miter saw (oops! I meant jigsaw) to cut a decorative edge on the bottom of these pieces, but I wanted to wait until I got home and could search online for some inspiration. I found this one that I really like, so I’ll probably end up using this to make a pattern that I can use to cut a similar design into my bottom pieces. And the last step was adding a top. 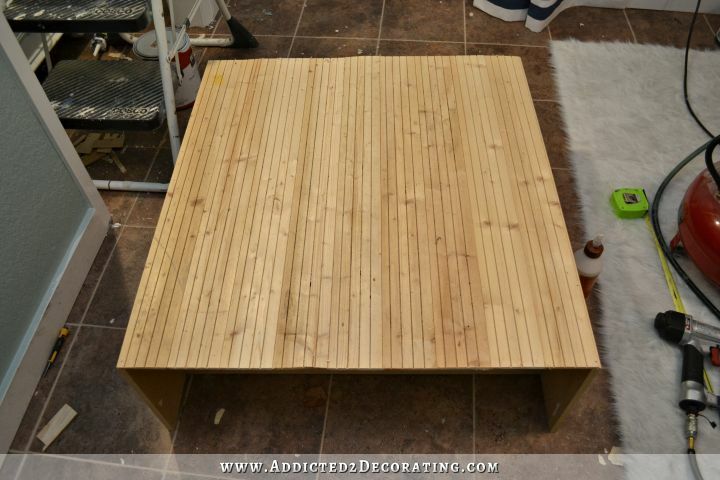 Just about any wood can be used for a top — plywood, MDF, boards, etc. 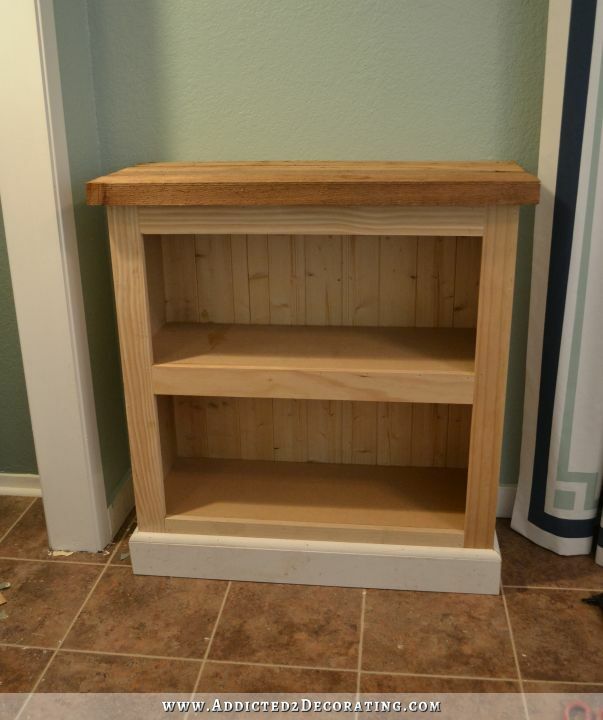 — and I had just enough cedar 2″ x 4″ lumber in my scrap pile for a top. I cut them to the width of my bookshelf, plus two inches, and then glued them to each other and to the top of the bookshelf. 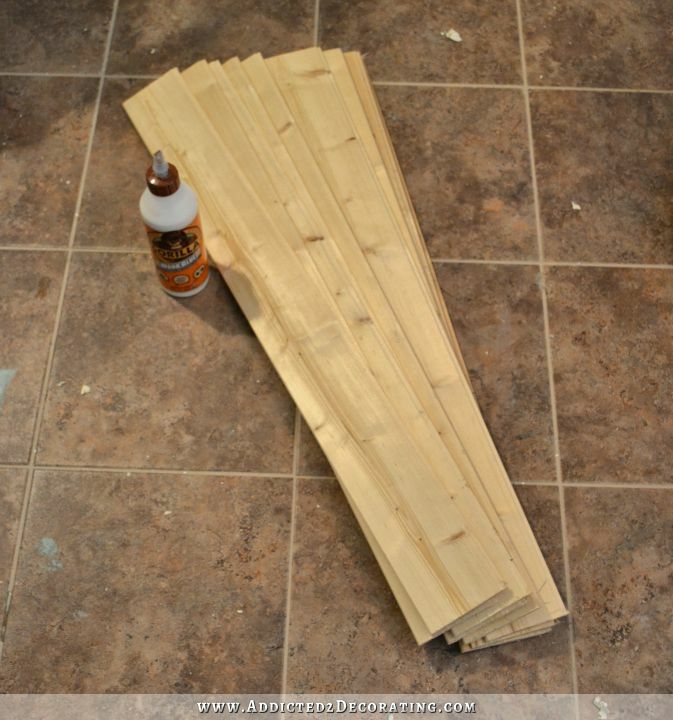 I would normally use my Kreg Jig to make a top like this so that the boards are securely fastened to each other, but since this project was kind of a spur-of-the-moment thing, I didn’t have my Kreg Jig with me. Since it’s cedar, it’ll need quite a bit of sanding, but it’ll look great when it’s finished. I know because this cedar is also what I used for the top on the built-in bookcases in the living room. 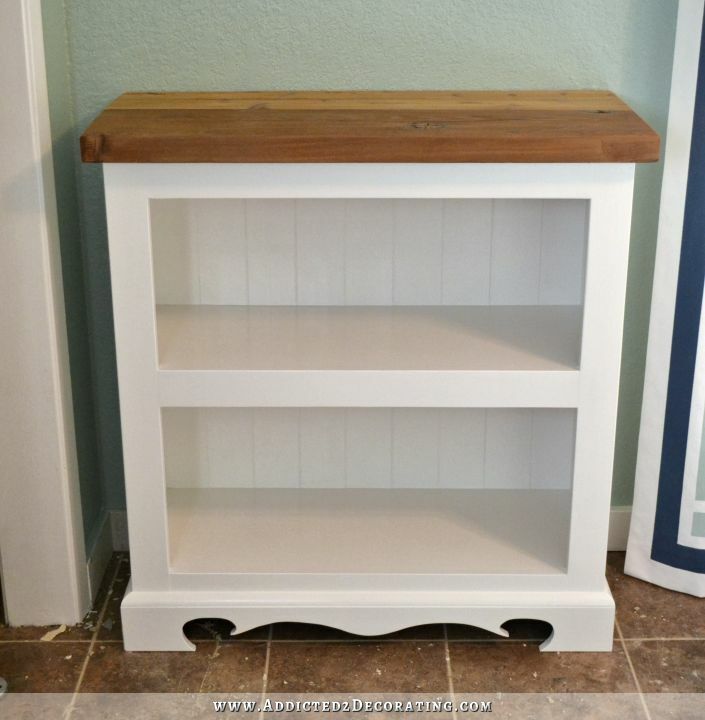 I’m so proud of this little bookshelf, not because it’s just oh-so-beautiful (although I do think it’ll look very nice after I’ve caulked, primed, and painted it), but because it was completely made of scraps. Instead of tossing them into the dumpster, I made them into something useful. This bookshelf took me almost exactly two hours to build, but one reason it took that long is because I was using scrap MDF (this was MDF that was used on the first closets that I built in here) that had nails and construction adhesive on it. So I had to spend time removing all of the nails, and scraping off the construction adhesive. So it could certainly be done in less time if you’re using new materials that don’t require those extra steps. I’ll be sure to take a picture of the finished bookshelf once I have it all painted, and I’ll show you how it turned out when I finish this room and give you the whole before and after tour. It shouldn’t be long now. Now that I have the floor grouted, all of the wallpaper removed, the other two walls patched and painted, and the rest of the baseboards installed, my “to do” list for this room doesn’t feel overwhelming anymore. I just have a few small things left, like adding a bit more shoe moulding, painting the remaining trim, giving the door a second coat of paint, plus a few more small things. Nice job! My hubby is always threatening to burn my scraps. He just doesn’t get it! You might try looking on Ebay. You might be able to find used tools at a very low cost. Amazon is also a good place to find a bargain. Good luck Marlene! Kristi, I found your web site yesterday just by chance and can’t stop reading :). Everything is so interesting and looks great! Thank you for sharing your experience! I find it hilarious that you actually think anybody – apart from you – could finish this bookshelf in less time than you just did if they didn’t have to get rid of nails and glue before actually buidling the thing 🙂 At least I cannot picture myself being that quick, but I’m in awe that you accomplish tasks like this in so short a time – you’re definitely the DIY superwoman!!! Hahaha! That’s funny. I’m always thinking that! Love the project, but being someone who has all the bookshelves filled to breaking point I have an objection – the trim on the shelves is decreasing the height available for books and I know it would drive me nuts. 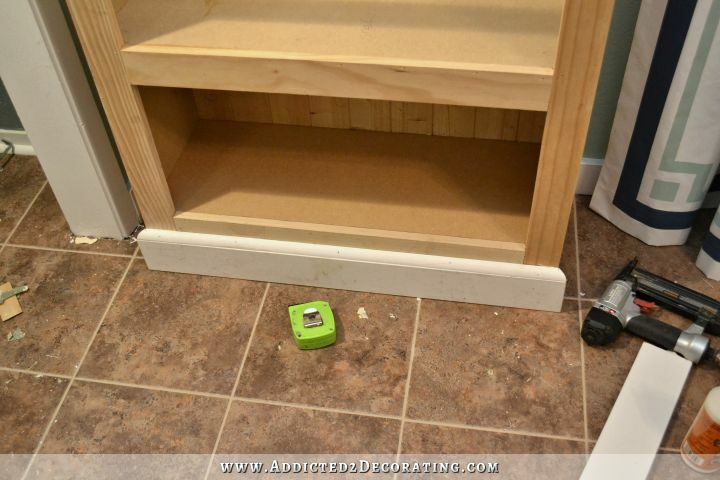 The trim is this case serves as more than just decoration, it adds strength to the shelves so they don’t sag over time from the weight of all those books!! Awesome!! What a great detailed tutorial! Love it! I love that little bookcase. It would make a great size for a bedside table, too. What color will it be? 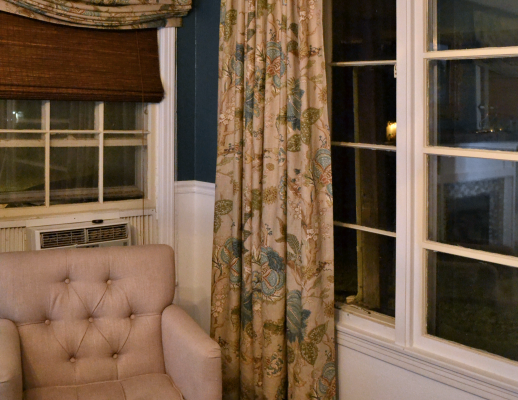 I would love to see it painted navy blue and staged with white and gray so that it contrasts with the curtains. You are such an inspiration. It probably wont’ be blue, because if I’m being totally honest, the whole reason I wanted something right there (bookcase, or chair with side table) is because I bought a navy blue lamp that I just HAD to use in that room., in that particular corner. 😀 Yep, it’s all about a lamp. 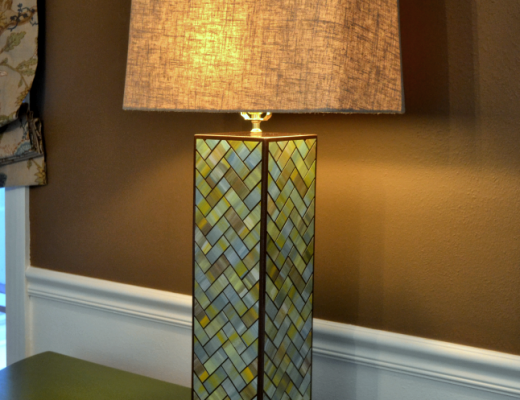 And it’s not even a particularly special lamp, but for some reason I just wanted it in that room. So it’ll need to be a color that will complement the navy blue lamp. 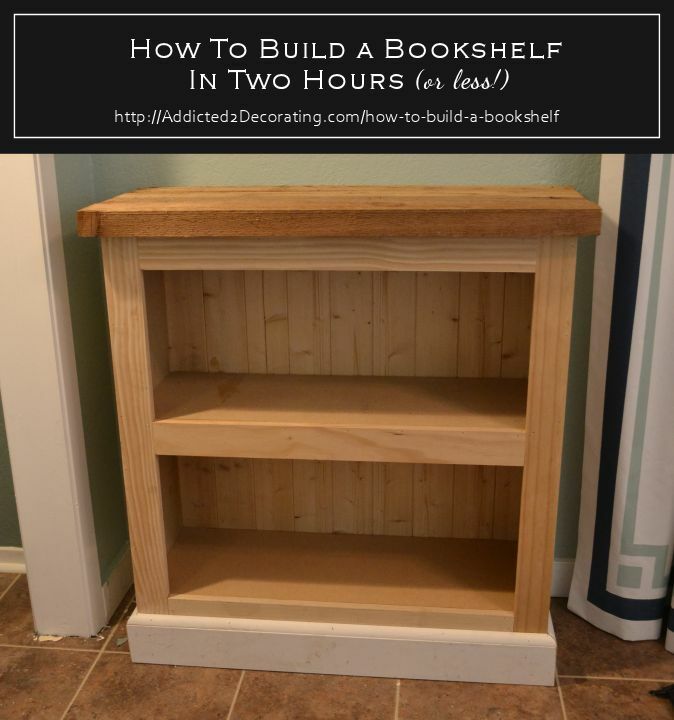 IMO this is more useful than a tutorial on making a bookshelf from all new stock. This one explains where you need some strength & where to think about the decorative touches that can make a huge difference. Terrific! 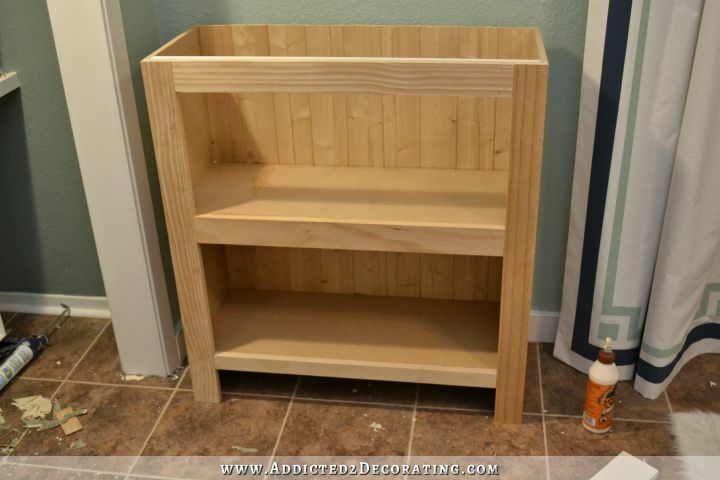 I think you should paint the bookshelf, except stain the top. Would look awesome. Oh good! That’s what I was planning. 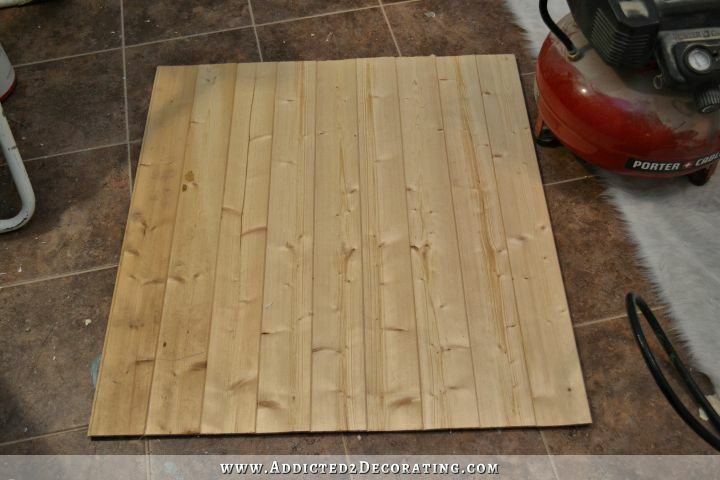 I love the way the cedar looks when it’s sanded and stained, and I love the warmth that stained wood adds to rooms. Yay – so glad that you are leaving the top natural – cedar is breathtaking when used right. I love that you mad it out of scraps and it looks professional — AND it was a spur of the moment ‘wing it’ design! 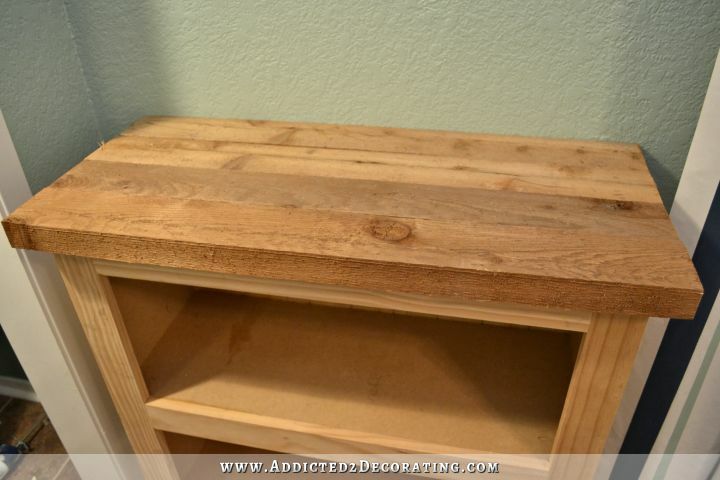 You must have been a carpenter in a past life and your old projects are coming back in your new DIY life! The staging of the condo is looking remarkable! PLUS since you are not planning on using any of the items again – you can use it as a selling point that everything comes with the condo! When we sold our house, the buyer actually asked if we would be willing to sell it with all of the furniture in it – alas because it was brand new – we declined. But, in your case, I think its a good selling point! Keep up the great work Chicka! It looks Marvelous! Ha Ha! I think you’re right about her being a carpenter in a past life!! – that PLUS a seamstress, artist, etc., etc.! Kristi, I’m assuming you meant a jigsaw where you said miter saw to create the bottom decorative edge, otherwise, I’m totally confused. I don’t think I’ve mentioned to you that you inspired me to BUY a miter saw myself, approximately a year ago (maybe it’s been longer?!!??). I’m SCARED to try to use it!!! I’m intimidated by it, and DH is NOT very encouraging. Son-in-law saw it (in the box) in the garage, and just assumed it was DH’s. Hrmmmph!!! It turned out great. I love the wall color. Leave it to you to pull this off. So adorable. You are going to sell so quickly! Love this! Amazing! and looks like it’s perfect for that spot! Very good directions for this project! Very helpful. You never cease to amaze me. Thank you for your for your continueing inspiration! I would love to spend a week with you, just following you around and watching you at work and helping. It would give me the courage and confidence to do turn my ideas into reality!!! You deserve your own tv show!! You are truly amazing – your ideas are fabulous – and very realistic for someone on a limited budget. I love your site and have learned so much from your posts. I want to be you when I grow up – and I am 68 and on my way out!! Is it part of the staging,or will you keep it? What kind of lumber is best for a Florida home? The Fella is making a Morris chair using red oak to take to our not-bought-yet retirement home. My copy cat book shelf from my scraps is about 50% complete. It’s taking much more time than two hours, but it’s ok…..Cuz if it looks like yours in the end….then I’m thrilled!! Mine is 72 W by 49 H by 12 D inches and has a 48 inches wide center piece and two 8 by 14 recessed sections on each side. But it’s all scraps and it’s your pattern. Merry Christmas to me! Thanks for the gift of inspiration. Susie, please post a picture when you finish it! I’m happy to…but where would I post? Will this thread allow photos? P.S. I’m sitting in front of it measuring for the final trim…it looks awesome. Kristi’s pattern made it so easy. My husband is going to build a set of bunkbeds for our younger son and our soon-to-be-adopted son from China. He had all the wood cut and left the scraps out for me and a daughter to use for any project we might like. I’m a handyman in my head. In real life, not so much. 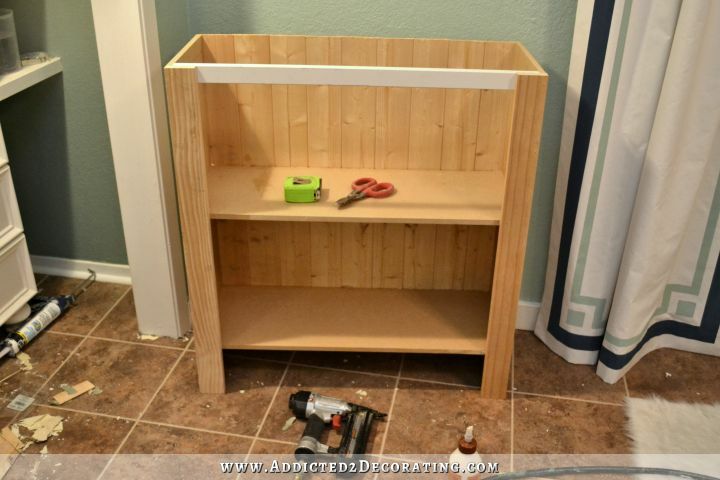 However, I tackled making myself a side table because of this post. It looked more like an adventure for the Griswold family but, with the help of my son and husband, I am on the way to finishing a nice little bedside table/shelf. I love this! Due to my ridiculous obsession with reading, I have been in need of a new bookshelf for months. I am most definitely going to attempt to make this. 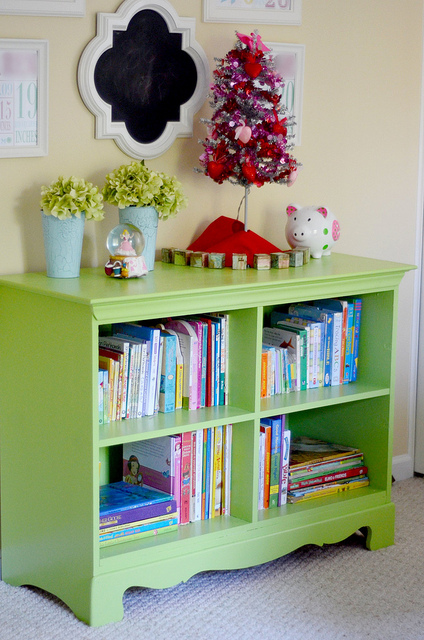 I personally think this looks just as good as the smaller bookshelves you can buy in the store! 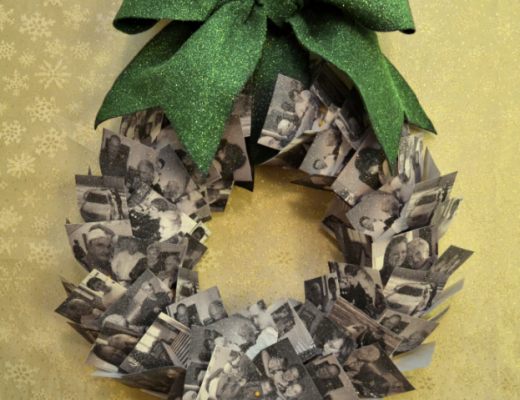 This turned out beautiful and your instructions are so easy to follow. 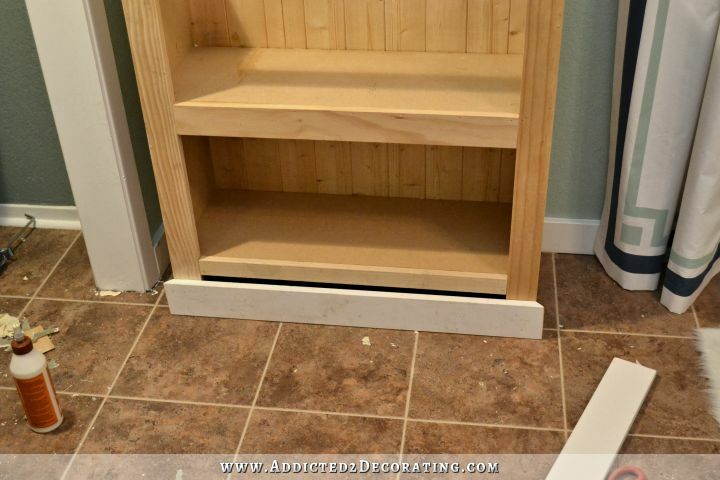 I am planning to build a similar looking shelf to go at the end of a breakfast bar, under the counter overhang, and this was a huge help.